It was with a little skip of joy that I spotted some short ribs in The Ginger Pig on Lauriston Rd, home of Borut, the butcher king of London town. They were tucked shyly away behind some steaks, just waiting for some happy soul to come along and give them a home. And boy, I thought as I scuttled away clutching my treasure, do I have a home for you. 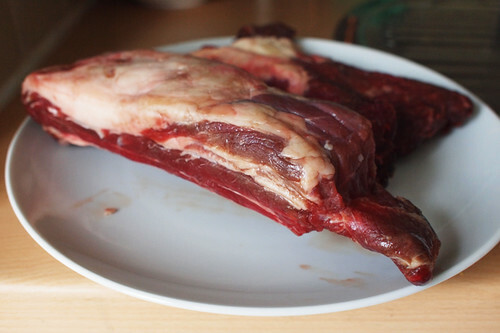 I’ve been itching to get my claws on some short ribs for ages, keeping a beady eye on all my local butchers. I’d seen them in the US, usually marinated and slowly barbecued until the fatty meat is falling off the bones. But here, where pork and chicken rule the BBQ roost, no sir, no short ribs. They’re actually called Jacob’s Ladder here in the UK, which would explain why I’d never spotted the cunningly disguised buggers. The bovine equivalent of pork spare ribs, they are full of fat, tendon and meat – all beautifully interlaced and crying out for some long slow cooking. 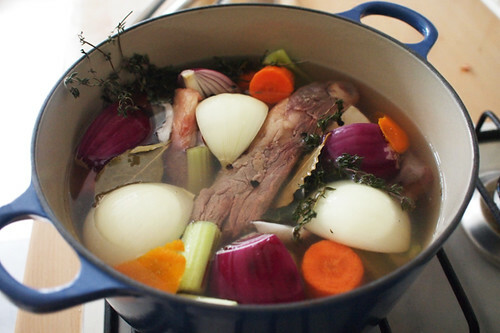 I figured, what with the winter chill in the air, a long slow braise would be the way forward. Something to warm the soul as well as the belly. Food doesn’t come much more soulful than pasta. Chuck a heavy red wine into the mix, and the idea for a short rib ragu was born. Some of the best pasta I’ve ever eaten was Oxtail ravioli and the principle here is the same. The meat came out so tender just staring at it hard made it fall into a heap of moist pieces. The red-wine enriched sauce was gloriously intense. All those strong beefy notes balanced out in a sweet-savoury thickness. Heavenly. Chucking in the meat made it one intense ragu, the slow cooked fatty flesh giving it far deeper flavour than your standard sauce. The ragu clung to the linguine like a cub to mummy bear, coating the toothsome lengths in a rich, savoury sauce. It was a muscular, rib sticking, cockle-warmer of a winter plate that makes you feel all rustic and warm inside. The secret to this dish is to make it the day before you plan to eat it, a night in the fridge will improve the flavour no end. It’s not so much about the flavours becoming more intense (although they do), it’s about them melding together to form something greater than the whole. It makes all the difference in this slow maturing dish. Put the ribs and all ingredients, except the butter, flour and pasta, into a large pan, cover with water and simmer for three or four hours. Remove the meat and put on a plate to cool down a bit. Strain the rest of the stock through a sieve and ditch the solids. Put some butter into the bottom of a clean pan and put it over a medium heat. When the butter starts to fizz, stir in the flour until it goes a light nutty brown. Slowly pour in the stock, stirring all the while to avoid lumps. Then Add half a bottle wine of decent wine – I used a Rhone – then bring to a simmer, stir in the tomato purée, and leave to reduce. Once the meat is just cool enough to handle, pull it into shreds with your fingers, picking out and discarding the fat as you go. Once the sauce has reduced by about a third to a half add the meat, stir it in and take it off the heat. Put it in the fridge, covered, overnight. The next day reheat slowly for a while and cook the pasta. Mix them together, serve, sit back and revel in the taste. Some good winter warmers coming out of the Grubworm kitchen lately. I love short-rib, with my main exposure to them being in Korean restaurants where they go on the BBQ. 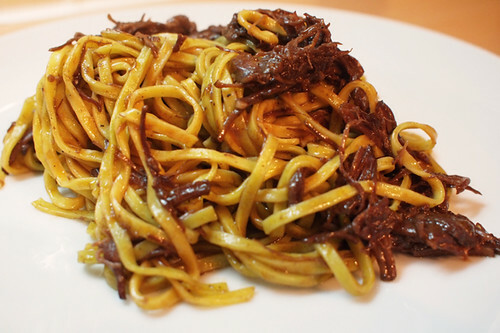 PS: I kid you not but that photo of the pasta could be mistaken for braised beef with e-fu noodles in a Chinese style. I adore short ribs and yup, no luck finding them here. Thanks for digging out their other name! Splendid! Surprising not to find tomato in this recipe, but all the more interesting for it. Ooh, I had a dodgy takeaway spag bol just now and I feel inadequate. @Su-Lin – it frustrated the hell out of me for a while, i had no idea that;s what Jacob’s Ladder was. I bet if you ask butchers that don’t have any on show, they’ll have some out back. @Gary – Agh! Well spotted, i forgot the tomato puree I added. But that was it. I’ll put it in now. It just adds a slight tomato tang to things. @meemalee – Heh! And I ate it for lunch the next day too – felt properly decadent. I spotted some short ribs here on my first shop and logged it for future reference. Love to have a go at some short ribs your recipe looks so easy and perfect for a bit of weekend pottering. @Vintage Macaroon – it is the perfect pottering recipe. Do a bit, go away for a while, do a bit more, chill out, sleep, reheat next day and eat. Heaven in a dish. @Helen – Why thank you! you know, everything on your blog looks so amazing, I wish I could cook! I would give my right arm for a plate of your beef ragu…. I am sure this would taste very nice with Spaetzle (however they are called in English) too. yum! Love the ‘meat came out so tender just staring at it hard made it fall into a heap of moist pieces’ and, obviously, loved the mama bear and cub reference. I am, after all, a bear.